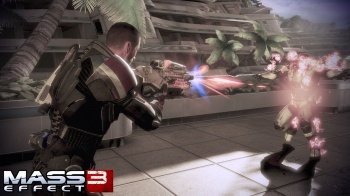 BioWare Wants to Make Mass Effect 3 "Seamless"
In order to make Mass Effect 3 as immersive as possible, BioWare has tweaked and tuned the game's engine. The Mass Effect games have some pretty awe-inspiring cinematic moments, like the Reaper attack on the Citadel in the first game, or the destruction of the Normandy in the second. Mass Effect 3 isn't going to be any different, but BioWare says that it wants to make blur the lines between cinematic and gameplay, and make the whole game as seamless as possible. BioWare's marketing director, David Silverman, said that having clearly defined action and conversation sections was detrimental to the game's feeling of immersion, and what BioWare wanted was for everything to feel more organic. The studio, he said, had taken advantage of recent updates to the Unreal Engine, as well as adding its own "special sauce" to the mix, so that there was a much less obvious delineation between the various parts of the game. "The Mass Effect 3 engine's based on Unreal but we definitely have made some significant upgrades in terms of the cinematic system has been fully improved," he said. "[The] mechanics have been altered. We've done some things to make the sound pop a little bit more, [and] the graphics have obviously been improved." A developer working towards making its game more immersive is always good news, but it's especially welcome in RPGs, where players tend to spend a lot longer exploring the world and its meeting its various peoples. This, combined with the deeper RPG elements that BioWare is re-introducing into the series, sounds like it could make for a pretty stellar game.